This renovated country house is set in a typical French hamlet attached to a small cottage rarely used by its English owners. This 4 bedroom 2 bathroom, renovated stone built country house is set in a typical French hamlet attached to a small cottage rarely used by its English owners. The property is full of rustic charm combined with modern day living, the location is ideal for nature lovers with great walks from the house and a small river accessible via paths in the surrounding fields. The property boasts a private pool, and large sunny terrace for outside dining and relaxing, with a small enclosed garden and a further 3.5 acres of land comprising woods, field and path to river are also great for exploring. Mareuil, only a 5-minute drive, has a pretty château, bakery, restaurants and shops. More shops can be found in picturesque Brantôme, which sits astride two rivers and is a lovely place to spend the day browsing the shops and narrow streets. Why not take a canoe down the River Dronne, or explore the fabulous countryside on foot or by bike. The region is famous for its fresh local produce and foie gras delicacies. Most towns have colourful weekly markets and stage cultural events. This beautiful villa is made from brick or stone and was originally built in 1700 and refurbished in 2005. The agent has rated it as a four star property so it is a well-equipped villa with above average furnishings. It is also great value for money. 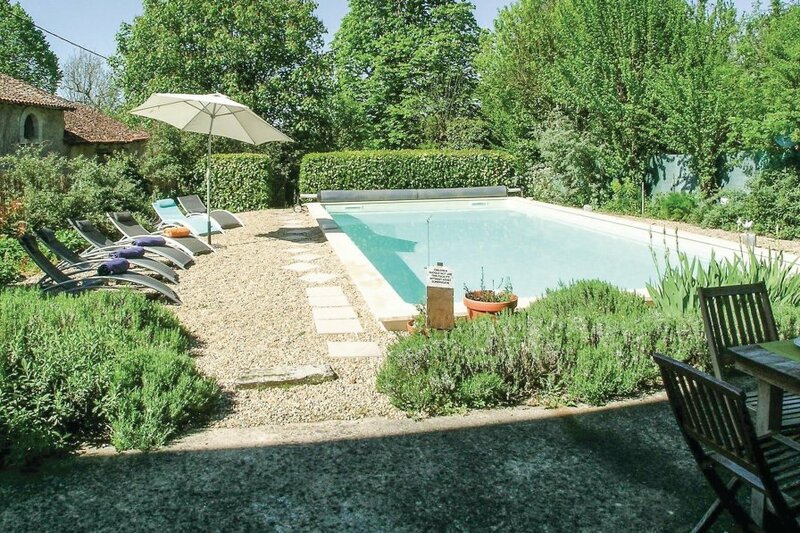 This villa has a swimming pool and is located in Mareuil en Périgord, 30km from Angouleme. It is set in a good location: there is a restaurant 5km away. The villa has free wireless internet. The villa is well equipped: it has a microwave, washing machine and dishwasher. It also has a barbecue, a garden and some garden furniture outside.